The KB Articles plugin works both as a global knowledge base (i.e., you can write articles that are not associated with any specific WooCommerce Product), and it also makes it easy to build Product-specific knowledge bases too. Whenever you create a new KB Article, you can choose to connect that article to a specific Product, or not. This is accomplished using the Product-Specific KB Meta Box, as seen in this screenshot. With Product-specific KB Articles having been published, you can then display a list (summary) of those KB Articles on each of your Product pages. In WooCommerce, whenever you create or edit a Product, you will find a new meta box in WordPress where you can control the contents of a new Product tab for the knowledge base. Note: By default, the Knowledge Base tab takes advantage of the [kb /] Shortcode, which generates a summary of KB Articles for the current Product. You can customize the Shortcode Attributes to alter the list of KB Articles, Categories, Tags, etc. You can also add additional text, graphics, and any other custom elements you need. The KB Articles plugin adds two Product Endpoints to WooCommerce. These Product-specific Endpoints are not essential though, because the KB Articles plugin also supports Post Type Archives in WordPress. These additional Endpoints merely exist to provide shop managers with easy-to-use redirects that they may find useful. Adding /kb onto the end of any Product Permalink will automatically redirect a visitor to the official URL on your site that lists all KB Articles for that specific WooCommerce Product; i.e., this redirects a visitor to a filtered Post Type Archive in WordPress that will showcase an archive of all KB Articles for the Product. Adding /kb-article/[slug] onto the end of any Product Permalink will redirect to the official URL for a specific KB Article for that Product. Where [slug] is the Slug for a specific KB Article that was written for the Product. Note: The /kb and /kb-article Endpoint slugs can be changed, if necessary, from the plugin options page. For example, if you prefer, you could change /kb-article to just /kba. 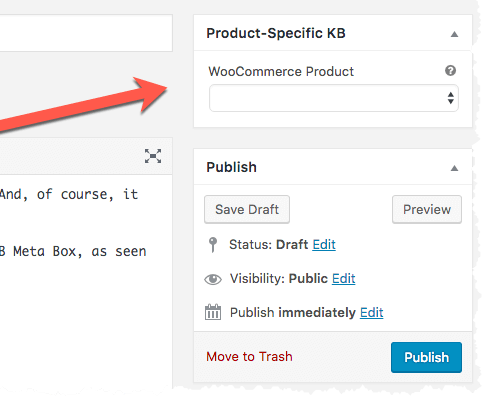 The KB Articles plugin also integrates seamlessly with WooCommerce Breadcrumbs. This may appear differently, depending on which WooCommerce theme you're using, but here is a quick example of how the KB Articles plugin automatically adds links/data to the WooCommerce Breadcrumbs bar. This screenshot was taken on a site running the Storefront theme for WooCommerce. 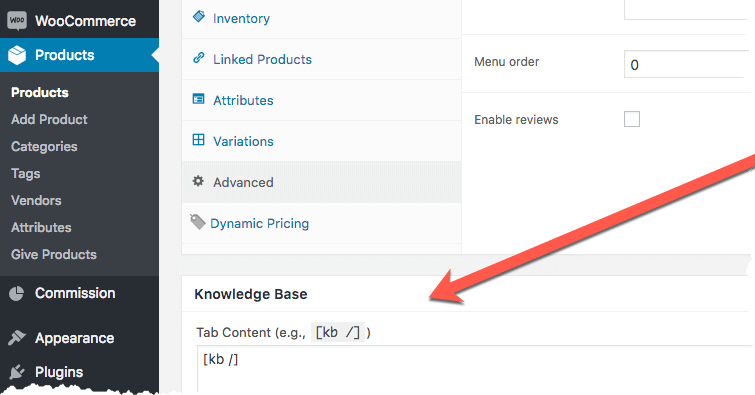 Where KB is a link to the knowledge base overall (i.e., all KB articles) and Awesome Sauce is a link to a WooCommerce Product-specific KB. Finally, this screenshot was taken from a single KB Article; WooCommerce Compatibility was the title of that Article.